We think that the Sagas of Icelanders are perhaps one of our best sources of information about how Vikings used their weapons: the kinds of moves they used, the weapons that they used, and the mindset and beliefs that guided them in their fighting. But the sagas present neither a clear nor a complete picture. The historical elements that form the basis for the sagas are mixed with elements of fantasy and fiction. The sagas are like a jigsaw puzzle with many missing pieces and with a few pieces mixed in from some other puzzle. In our research at Hurstwic, we use a variety of sources to help us fill in the missing pieces and to clarify the picture. 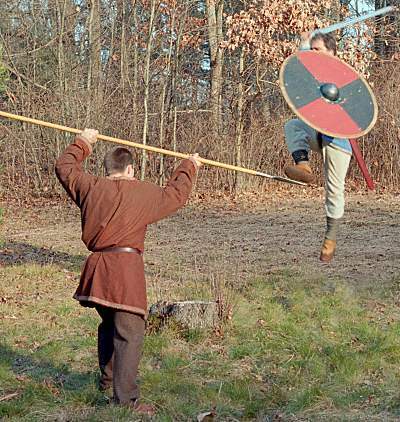 Some of the missing pieces are key to our training, such as fundamentals: fighting skills that a Viking-age child would have trained in from the time he could walk, and honed and refined through a lifetime of fighting and sporting competitions. 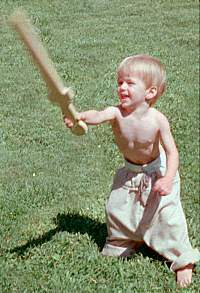 These skills include such things as how to use a weapon to attack, how to use a tool such as a shield to defend, how to fight empty-handed, and others. Some of these fundamentals are universal. The options are limited because of the way that human bodies are constructed and operate. Some of the fundamentals can be inferred from other activities, including agricultural activities from the Viking age and sporting moves from the Viking age. In our training, we do drills that exercise these fundamentals in isolation where they are not affected by any other aspect of the fight, and where we can focus our full attention on the fundamental skill of interest. The drills may require that a number of fundamental skills be used together, but the focus is on one area, which may be quite narrow. 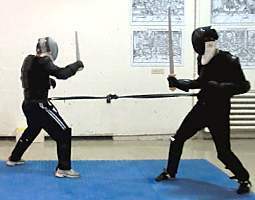 For example, a particular stepping movement can be exercised in a cutting drill requiring that the desired movement be used either in response to an attack, or as part of an attack. We measure our improvement with a test we call sparring, a force-on-force combative examination of our ideas, our approaches, and our moves. 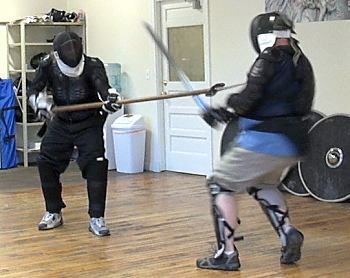 We use the word sparring to describe many kinds of force-on-force combative situations, each with different kinds of training weapons, different kinds of protective gear, and different sets of rules, depending on what we are testing. We will describe these differences later in this article. 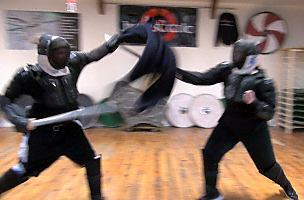 Sparring is not fighting, but it is as close to fighting as we know how to achieve with reasonable margins of safety. Fighting has no rules. Sparring has rules. Sparring is not practice, but it is training. 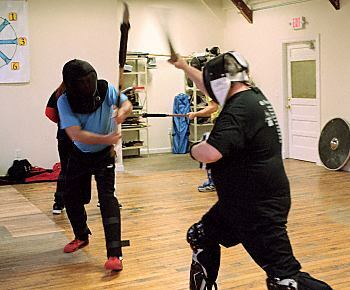 Sparring is the test that tells us what we must practice next. 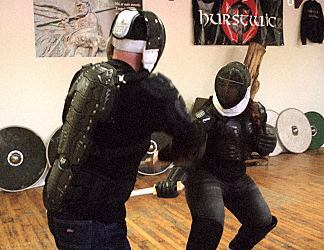 Sparring is not about counting up hits, or scoring points, or pretending to be killed, or even about winning or losing. Our goal is not to judge the superiority of a person, but the superiority of an idea, a move, or an approach. 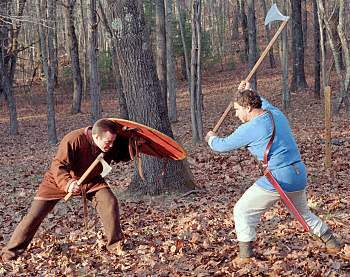 Sparring is not a competitive bout, or a public entertainment, or a sporting game. Instead, sparring is about learning. It is about putting ourselves in a high pressure, force-on-force situation and then looking objectively, without emotion and without ego, at what just happened in that situation. Sparring is about examining ourselves and measuring our progress on our journey towards becoming better, more capable fighters. 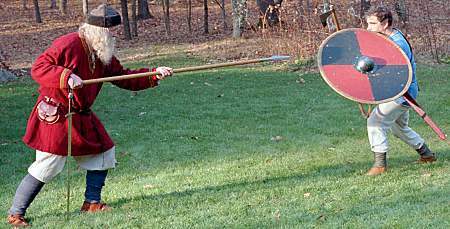 In the end, all of what we do must be tied to Viking fighting, which is more than simply using Viking-age weapons and guessing how the weapons might have been used, and which is more than making up rules to turn the fight into a sporting competition. 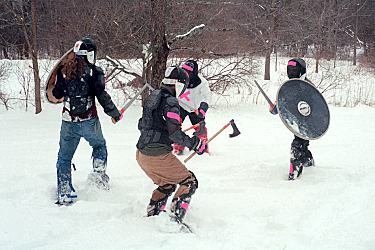 When we practice, we want an observer to be able to identify our fighting moves as Viking fighting moves, not because of the clothes we wear, or the weapons we wield, but because we move like Viking warriors, as described in the sagas. 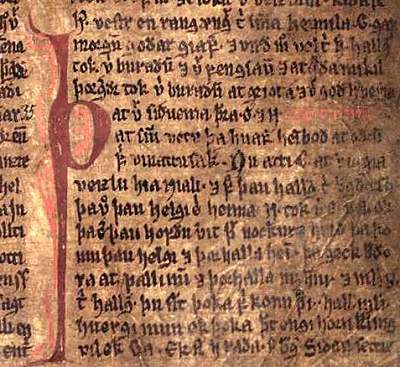 We try to tie our work firmly to the sagas and other available Viking-age sources. 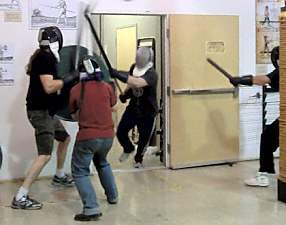 Sparring is one way to make that connection. Are we using the movement to our advantage during the round? Are we seeing available opportunities to use that movement during the round? Are the movements consistent with moves described in the sagas? Would a warrior having the mindset admired in the sagas choose to use these moves? The answers to these questions help us decide what the next steps should be in training. Is the move that we practiced in isolation still performed well when we can choose it from many possible ways to move? Are we using the move at the right time? Or are we not recognizing when to use it? Or are we using it when it might not have been the best choice? Are there moves we could have used instead, but which we are uncomfortable with using? Are the moves consistent with the moves described in the sagas? The answers to these questions also help us decide what the next steps should be in training. Does the move work the way it did in the saga? Can we figure out how to execute the move? Did we execute the move poorly because of weakness in fundamental skills? Is there a way to strengthen our ability to do the move with an isolated drill? Did we recognize the right time to use the move? The answers to these questions help us decide what to do next in our training. Sometimes, we set up a scenario similar to what is described in the sagas and spar based on that scenario, in which no particular moves are encouraged. 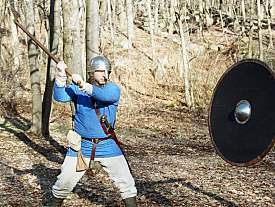 We put ourselves in a simulation of the situation faced by Viking-age saga characters, and armed with practice weapons similar to the weapons used by saga characters, we spar to see how we react to the situation. Were there fundamental skills that were weak or poorly applied? Did we use moves that are similar to those described in the sagas? Did we know when to use those moves? Did we have the same outcome in sparring that is described in the sagas for that scenario? Did the "winner" have superior tactics, or better moves, or was it just luck? How does this answer compare to what the sagas say about the "winner"? If the outcome is different from what the sagas tell us, what can we learn? 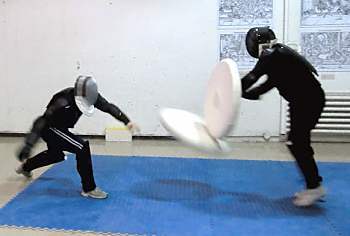 Was there a better move we could have used in sparring that we didn't use? Maybe a completely different strategy to solving the problem? The answers to the questions we ask ourselves during and after sparring guide us in what to do next. If there were problems with the fundamentals, we return to the drills and work on the fundamentals in isolation. If fundamentals were improved, but still not good enough, perhaps we devise a different drill that helps us bring the fundamental skills to the level of performance required by sparring. 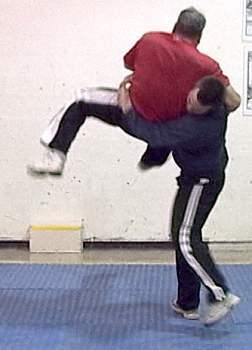 If the fundamental skills are ok, but we're using them inappropriately, then perhaps we devise a sparring drill that helps us recognize and use a better move or a better tactic. 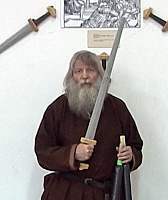 Our end goal is to learn how Viking-age fighters used their weapons. 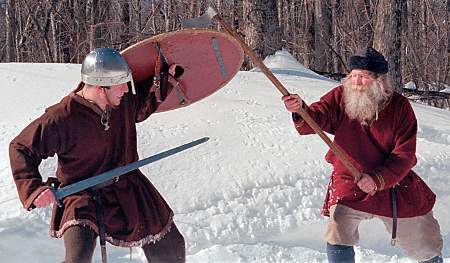 The sources we have available that could teach us these things are limited, but we try in every way to tie what we do in the training room to what we know about Viking-age fighting from the sagas and other sources. 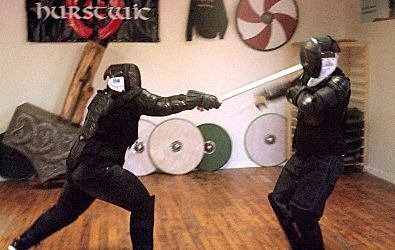 When we set up a scenario for sparring, we choose scenarios that are described in the sagas. When we practice a move in isolation, we choose moves that are either described in the sagas, or have some support in the sagas or from other evidence. 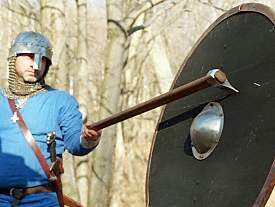 Throughout our practice, we try to keep the Viking-age warrior mindset (as it is taught in the sagas) in our minds, to the greatest degree possible consistent with safety. We often stop and explicitly connect our work with material from the sagas by reminding students of the saga where the move or scenario or mindset is described, and of the saga hero (or villain) who demonstrated them. 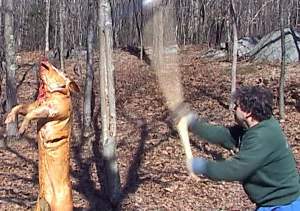 We use other tools and other tests to verify that our fighting moves yield the same results as those described in the sagas. 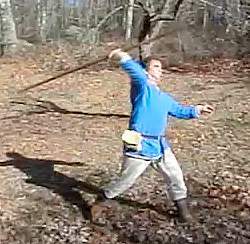 For example, when we practice throwing weapons, we use sharp steel weapons against targets to verify the distance, accuracy, and penetrating power of the throws. We use sharp steel weapons to cut against a shield to verify whether the level of protection (or lack of protection) provided by the shield matches what is written in the sagas. 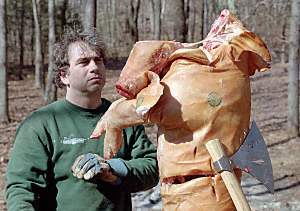 We judge how well our attacks work against flesh and blood by using sharp weapons against animal carcasses to see if they inflict injuries similar to those described in the sagas. 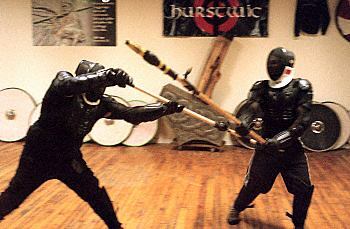 practice swords In our practice sessions, we use a variety of weapons, depending on the goal of the exercise. 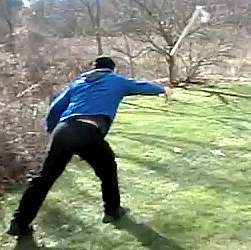 Sometimes, we use steel weapons because nothing else will do to test our ideas about Viking fighting. 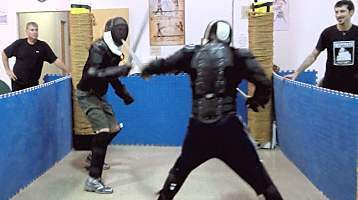 Sometimes, we use practice gear covered with padding because the move from the sagas we practice has a high risk of a powerful hit to a sensitive part of the body. 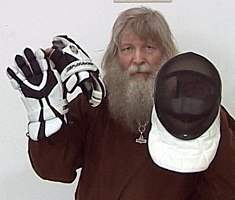 And sometimes, we use practice gear between these two extremes in combination with protective body armor because we want to spar all out, full force, to nearly every target. 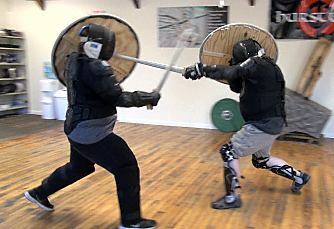 In each of these situations, we have the same two goals: we all want to leave the practice floor as we entered it, as friends and collaborators, whole and uninjured; and, we want to research and to learn how Vikings used their weapons and how they fought. To the extent possible, we want to train with their level of intensity, their improvisational skills, and their mindset. 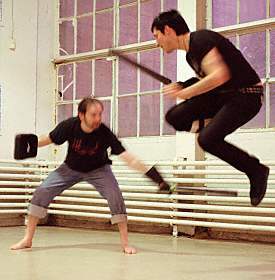 Anything less means we are not practicing Viking fighting moves, but rather something more like stage combat or re-enactment combat. These are worthwhile and challenging arts to study, but they are not the arts we wish choose to pursue. We are not stage performers. We are not a sports team. Instead, we seek to understand and practice the fighting moves used by Viking-age warriors as described in the Sagas of Icelanders and other historical sources.